Rubber Room Ramblings: BEAUTIFUL WINGS EMBOSSLIT! I love the look of the butterflies made with vellum. I think it gives this card a really elegant look. 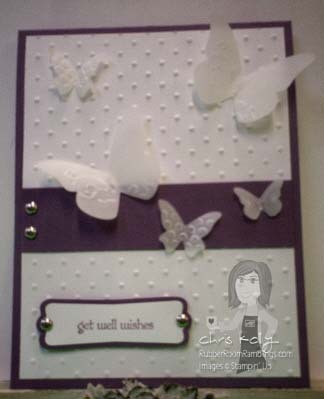 I used the Teeny Tiny Words stamp set, along with the dotted embossing folder and the Beautiful Wing Embosslit. With the Teeny Tiny Words stamp set, you can easily make this a birthday card, a sympathy card, an Easter card, etc... very versatile! This is the Get Well card we will make at April's Quad Class on April 6th. Check out my class schedule for complete class details. You must RSVP by April 1st.